Birthplace : San Francisco, California,U.S. Andre Ward was born on February 23, 1984, in San Francisco, California, and raised in the Bay Area by his parents Frank and Madeline. In school, he excelled at all sports and his skills on the football field drew the interest of college recruiters. However, Ward dropped out of school before reaching his senior year. He was too busy earning an education in the boxing ring. His father had been a top amateur heavyweight with an impressive 15-0 record, and the elder Ward could see the fighting spirit of a boxer in his son. "My father just loved to fight," Ward told USA Today. "It's the same reason why I got into it, because I love to fight. But you've got to do it in an organized way. It's too dangerous in the streets." Frank Ward took his son to King's Gym in Oakland, California, and put him under the training of Virgil Hunter, a top local boxing coach, family friend, and young Ward's godfather. Not only did Ward prove to have the raw talent for the sport, he had a single-minded desire that was unusual for someone so young. While other kids slept in, he would rise a full three hours before school to hit the gym. His hard work paid off, and he was soon holding his own against some of King's teenaged boxers. However, it wasn't enough to give him a victory during his first amateur fight at the age of ten. The loss pushed Ward to work even harder and when a rematch was scheduled, Ward trounced his opponent thoroughly. By the age of 14, Ward had started a winning streak that continued to hold in 2007. His relationship with Hunter also held. The trainer and his wife became like family to Ward. As a teenager, Ward gained a reputation for the lightening speed of his punches and his ability to hit with both his right and left fists. He also impressed with his capacity to take down bigger boxers. Though his natural weight falls easily in the middleweight classification (155 to 160 pounds), he chose to fight in the light heavyweight division (161 to 175 pounds). This decision was not based on a boastful display of prowess, but rather a simple commitment to family. His cousin, DonYil Livingston was a middleweight boxer. "We made a pact we wouldn't fight each other," Ward recalled to USA Today. The weight difference never affected Ward's success in the ring. "A lot of guys, they see my physique and they misread me and they think I'm weak,"Ward told the Knight Ridder/Tribune News Service following a 2004 bout. He added, "I've been fighting bigger guys my whole life." 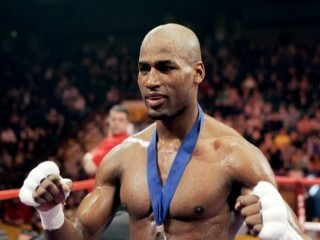 From 1998 on, Ward steadily climbed up the amateur boxing ranks as a light heavyweight. As he won bout after bout, he started racking up awards including the U.S. National Championship in 2001 and 2003 and the Under-19 National Championship in 2002. At every match, Ward's father Frank was ringside, cheering him on. Together, the two dreamed of bigger things. Frank wanted his son to go as far as he could as an amateur—the Olympics, a dream that was not always easy for the financially struggling Ward to follow. "There were times I got frustrated and wanted to turn pro and make some quick money," he told USA Today. Instead, Ward followed his father's dream and by 2004 was the top-ranked amateur light heavyweight in the country and headed to the Summer Olympics in Athens, Greece. Unfortunately, the elder Ward was not there to see his son's success. He had died suddenly from a heart attack in 2002. His father's death was a major blow to Ward. "My father was here today and gone tomorrow," Ward told the Tampa Tribune. "I needed some answers. The furthest thing from my mind was boxing." He found his answers in God, and Christianity became such a strong part of his life that he toyed with the idea of becoming a minister after the end of his boxing career. Until then, he reserved the ring for his preaching. "I believe this is my ministry," Ward told the Tampa Tribune. "This is a platform to give God the glory." He practices what he preaches out of the ring as well. Rather than going out on the town after a win, Ward heads home to his wife Tiffiney and their sons Andre Jr. and Malachi. "Whatever I'm doing with my family," Ward told the San Francisco Chronicle, "whether we're camping, bowling, going to the park, sitting at home doing nothing, that's my party." In Athens, with a picture of his father taped to his boot, Ward stunned audiences by solidly defeating bigger, more accomplished fighters including the six-foot-six Russian World Champion Evgeny Makarenko. After earning the American team its only boxing gold medal of the games, Ward returned to the States a champion and to the ring a professional. Fighting as a middleweight, he won his first pro match in 2004. Over the next three years, he added another 11 straight wins to his record. Along with his run of amateur wins, his streak has been estimated at over 60 fights. He has taken this impressive record in stride. "If I win a tournament or a big fight, I put it behind me the next day and just keep moving on," Ward told USA Today. "If you're worried that, ‘Oh, I've got 60 straight wins,’ to me that kind of takes your focus away. "Ward's focus was not going anywhere. He told the San Francisco Chronicle, "I'm looking at 12 years. I'll be 32. If everything goes well, get in, get out, make a lot of money and touch a lot of lives." He added, "It depends on how long God wants for me." Riding a winning streak that stretched back to 1998, Andre Ward entered the 2004 Olympics and pummeled his way to a gold medal. He followed that achievement by entering the professional arena where his rocket-powered fists downed bigger boxers and dazzled fans. By mid-2007, he had racked up an impressive 12 straight wins and was touted as the next big thing in boxing. "We feel he has the abilities to be a great world champion," promoter Dan Goossen told the Fresno Bee. Ward, a deeply religious man who goes by the nickname S.O.G. (Son of God) and has the name of his father and two children tattooed along his chiseled arms, wanted more. "As long as I am in this game I want to be the best that I can be," he said, according to the Goossen Tutor Promotions Web site. "I have a hunger, a desire to win that I believe is second to none. And I want to touch as many people as I possibly can touch, be it on the airwaves, on the TV, or just coming to my fights." View the full website biography of Andre Ward.